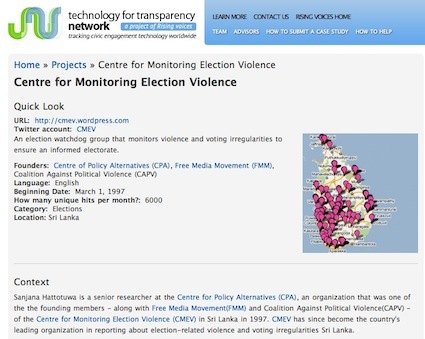 I was recently interviewed by the Technology for Transparency Network, an initiative of GlobalVoices, on the work I do with the Centre for Monitoring Election Violence (CMEV). They were particularly interested in the pioneering manner in which CMEV uses the web and the Internet to aid its work, which I had written about in detail recently (see Election monitoring using new media: Notes from my experience in Sri Lanka) and the publication of an election monitoring SMS template we had developed. The Technology for Transparency Network is a three-month, participatory research mapping to gain a better understanding of the current state of online technology projects that increase transparency, government accountability, and civic engagement in Latin America, Sub-Saharan Africa, Southeast Asia, South Asia, China, and Central & Eastern Europe. The project is co-funded by Open Society Institute’s Information Program and Omidyar Network’s Media, Markets & Transparency initiative, and aims to inform both programs’ future investments toward transparency, accountability, and civic engagement technology projects. CMEV is the first, and to date, the only example from Sri Lanka in a database of compelling examples from around the world where the web, Internet and mobiles have meaningfully helped keep the excesses of government and authoritarianism in check, opened out information to citizenry and allowed them to take participate more fully in processes of governance. I delivered a lecture at the Sri Lanka College of Journalism today on the use of social media in election reporting. The presentation I based my interactive lecture on is below. Aspect of the up-coming Presidential Elections are unprecedented in any number of ways. A point about it is that both leading candidates use social media to a degree that no other election in Sri Lanka has witnessed in the past. My submission was that literacy in social and new media is thus a perquisite in covering these elections, both to critically appreciate content produced by and placed online by candidates, as well as to gather information on election violence and other outrageous malpractices. I also used the lecture to suggest that the participants, leading mid-career journalists from print as well as electronic media in Sri Lanka, could use these tools to create media of their own, responding to issues they thought were under-reported, or were hostage to the bias of an editor, publisher or owner. This is not the first time I’ve helped plot violence related to elections in Sri Lanka. In my first post I noted that the map helped journalists better understand the degree of violence on the ground. Things are no better in the lead-up to the Western Provincial Council elections. Just like previous maps, this map is so packed with incidents of violence that you need to zoom into some places (e.g. Horana) to see the degree of violence on the ground. Shooting, arson, intimidation, assault, looting are common. Must democracy countenance the worst of us in public office? How can we improve, through civic education using mobiles and the web, voters more informed about key issues, candidates, their positions and political parties that are contesting? Kantipur in Nepal ran a comprehensive website in Nepali featuring information on candidates during their key Constituent Assembly Elections in 2004, interviews with them and their stances regarding vital policy issues. I don’t see a comparable effort here. Some leading bloggers have made an effort to interview som candidates and candidates themselves have leveraged web media (including Facebook), but overall there is little real awareness about the (oftentimes criminal and sordid) history of candidates. I feel that election violence can only be addressed if voter education results in the electoral defeat of those who indulge in such activities. For example, Vote Report India powered by Ushahidi is a great example of just how vexing elections in the world’s largest democracy can be. But unless awareness campaigns before an election, and advocacy campaigns after which bring to light, including name and shame, perpetrators of elections violence, these exercises alone, including my own, have little chance of really strengthening democracy. The problem with raising awareness before an election is that NGOs can never match the reach of an incumbent government’s propaganda, or even that of a political party, both of which have vested interests in keeping the public ignorant about the history of candidates and their violence. The problem with post-election advocacy is that placing the violence of winners in public scrutiny will almost always be (a) seen as a conspiracy to undermine the legitimacy of their victory (b) cast as a rival party political bid to discredit the electoral victory and the ‘will of the people’ (c) be seen as some sort of NGO / civil society campaign to discredit the winners. Technology alone then is no guarantee of cleaner elections. But technology can be part of the solution. Western Provincial Council candidates go online: So what? Duminda is a repugnant human being who happens to have money. The way he treats women alone is disqualification for public service. And yet he wins. Why? Perhaps because we haven’t offered an alternative. I’m now trying to figure out if/where I’ve registered to vote. I think I’m part of the problem. So what are the alternatives? Two other candidates from the UNP and JHU have created websites and even entered Facebook. Set up a quick and dirty way to get updates from Vikalpa’s islandwide network of citizen journalists on election violence and malpractices in the Eastern Province. This is the first of a couple of other interesting experiments using SMS + mobiles, blogs, Twitter and Google Maps that I want to try out in the lead up to and on the day of the elections in the Eastern Province in Sri Lanka on 10th May 2008. For those resident in the East or who receive information from the Province, please SMS Vikalpa on 0777312079 with your updates and news.